Professor Hartland obtained her BSc (Hons) majoring in microbiology and biochemistry and her PhD in microbiology from the University of Melbourne. She has held a Royal Society/NHMRC Howard Florey Fellowship in the Department of Biochemistry, Imperial College London and Lecturer/Senior Lecturer positions at Monash University, Australia. 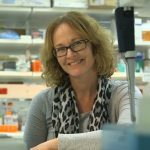 She was an inaugural Australian Research Council Future Fellow at the University of Melbourne and subsequently held the positions of Head of the Department of Microbiology and Immunology, Deputy Director of the Doherty Institute for Infection and Immunity and Acting Pro-Vice Chancellor Research Partnerships and External Relations at the University of Melbourne. 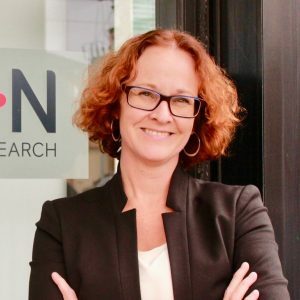 She is now the Director and CEO of Hudson Institute of Medical Research in Melbourne and Head of the Department of Molecular and Translational Science at Monash University. Professor Hartland has a long-standing research interest in the pathogenesis of infections caused by Gram-negative pathogens, with a focus on mechanisms of bacterial colonization and immune evasion. Using respiratory and gastrointestinal pathogens, the overall goal of Professor Hartland’s research is to identify and characterise the function of translocated bacterial effector proteins and the role of their host targets in immunity and disease. Pearson JS, Giogha C, Ong SY, Kennedy CL, Kelly M, Robinson KS, Wong T, Mansell A, Riedmaier P, Zaid, A, Mühlen S, Oates C, Crepin VF, Marches O, Ang CS, Williamson NA, O’Reilly L, Bankovacki A, Nachbur U, Infusini G, Webb AS, Silke J, Strasser A, Frankel G, Hartland EL (2013) A type III effector antagonizes death receptor signalling during bacterial gut infection. Nature, 501:247-51. Gomez-Valero L, Rusniok C, Neou M, Dervins-Ravault D, Petty N, Jarraud S, Steinert M, Heuner K, Gribaldo S, Medigue, C, Glöckner G, Hartland EL, Buchrieser C (2014) Comparative analyses of Legionella species identifies genetic features of strains causing Legionnaires’ Disease. Genome Biol, 15:505. King N, Riedmaier P, Schuelein R, Brown DL, Petru M, Zarsky V, Dolezal P, Luo L, Bugarcic A, Stanley AC, Murray RZ, Collins BM, Teasdale RD, Hartland EL*, Stow JL* (2015) SNARE molecular mimicry by a Legionella pneumophila Dot/Icm effector. Cell Microbiol, 17:767-784 *joint senior authors. Giogha C, Wong Fok Lung T, Mühlen S, Pearson J, Hartland EL (2015) Substrate recognition by the zinc metalloprotease effector NleC from enteropathogenic Escherichia coli. Cell Microbiol, 17:1766-1778. Brown AS, Yang C, Fung KY, Bachem A, Bourges D, Bedoui S*, Hartland EL*, van Driel IR* (2016) Cooperation between monocyte-derived dendritic cells and lymphoid cells in the acute response to a bacterial lung pathogen. PLoS Pathogens, 2:e1005691 *joint senior authors. Zhang Y, Mühlen S, Oates CV, Pearson JS, Hartland EL (2016) Identification of a distinct substrate binding domain in the bacterial cysteine methyltransferase effectors NleE and OspZ. J Biol Chem, 291:20149-20162. Pearson JS, Giogha C, Mühlen S, Nachbur U, Wong Fok Lung T, Zhang Y, Oates C, Ingle D, Hildebrand J, Dagley L, Bankovacki A, Schroeder G, Frankel G, Master S, Vince J, Webb A, Silke J, Hartland EL (2017) EspL is a bacterial cysteine protease effector that cleaves RHIM proteins to block necroptosis and inflammation. Nat Microbiol, 2:16258. Pollock G, Oates CVL, Giogha C, Wong Fok Lung T, Ong SY, Pearson JS, Hartland EL (2017) Distinct roles of the anti-apoptotic effectors NleB and NleF from enteropathogenic Escherichia coli. Infect Immun, 85:e01071-16.